This time we are going to speak about one of the biggest this year's fashion trends called pastel colors. They are ladylike and sweet looking hues that can be incorporated with almost any color. Believe me, this is a perfect choice for creating a lovely OOTD. This color can be mixed and matched with other pastels, as well as neutral hues. No matter, if you are an edgy girl or classy lady, there are easy ways to make this ethereal light hues work for you. They are totally in this year. We see soft shades, muted hues which are soft and cool. It feels like pastel hues come with that special innocent and gentle nature. Personally, I find these hues extremely sweet, delicate and delicious. Keep on reading to find out more. We see a great casual outfit that consists of knee-ripped light blue high-waisted jeans, pastel turquoise sweater, white lace-up slip-ons and white leather rucksack. If you are beginner to this trend, then let your base be neutral. I know many of you like to wear white, black or navy looks. If you do want to try on pastels, then the best way is to pair them with neutral color base. You can pair pink garments with crisp white shorts or skirt. Or you can try pastels to the office, by pairing black blazer with a pastel dress. If you are already familiar with this trend and you do want to keep things look sweet and chic, then go for colorblocking appearance. 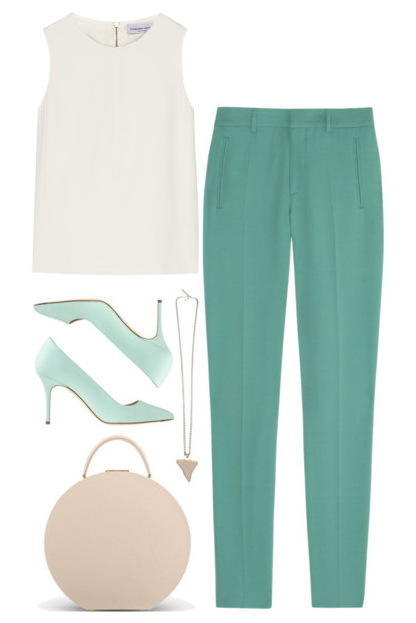 Try on bright bottoms and pastel color top. Or you can try on two pastel colors, by teaming pale blue frock with blush accessories. Try two pastels at the same time and I can assure, you will never be disappointed by that sweet looking result. This trend can make your summer a whole lot lighter and brighter. Anyway, I have some of my favorite Polyvore sets below to inspire you. Let me know your thoughts about this trend in the comments below.